The maritime collection of the Oysterponds Historical Society has been a key component of our holdings since OHS’s earliest days. 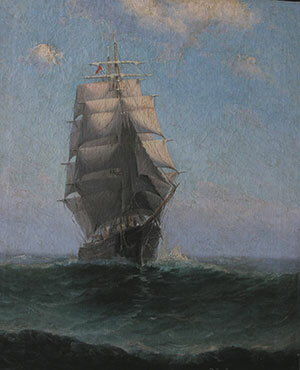 George R. Latham, one of the Society’s founders, bequeathed a splendid collection of ship portraits to the Society. 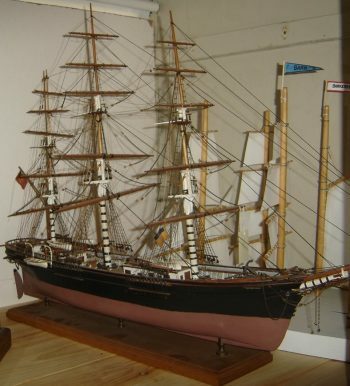 Complementing the ship paintings are ship models, nautical instruments, and various items of maritime interest. 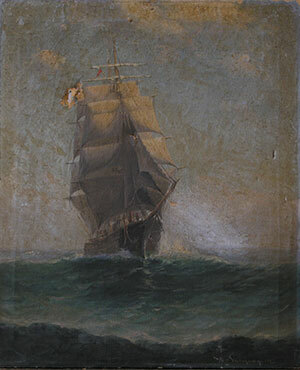 Many of the paintings and ship models are now in need of professional conservation. We need your help to restore, repair, and preserve these objects and works of art for many years to come. Caring for our collections is at the heart of our mission. We invite you to view the paintings and models below and to visit them in person. 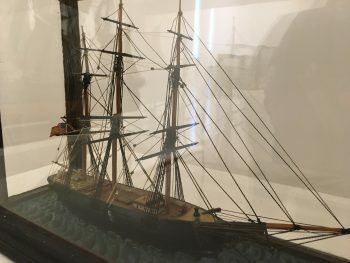 One of this year’s summer exhibitions features ship models, and many of the paintings are on display as well. Would you like to sponsor the conservation of a particular model or painting? 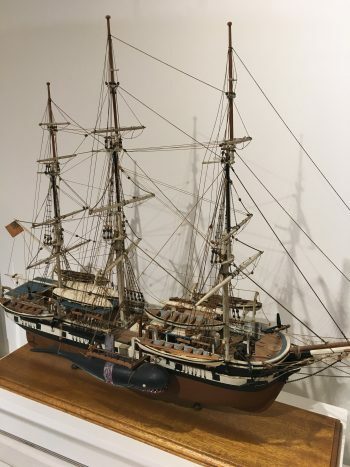 Sponsorships are available in amounts of $2,100 for a ship model and $1,500 for a painting. We will add your name to the display and collections label. Let us know your favorite. You can sponsor in your name, as a gift for someone, or anonymously. We also welcome contributions of any amount to the Maritime Collection Conservation Fund. You can donate now, or raise your paddle at the Summer Benefit to support the preservation of this valuable collection. For more information, contact Executive Director Elsbeth Dowd at director@ohsny.org or 631-323-2480. Paintings and other works of art begin to age as soon as they are made. Even when cared for properly, materials decompose and dirt accumulates. Objects may also become damaged. Paintings may suffer paint loss, weakened canvas, tears, and insect damage. 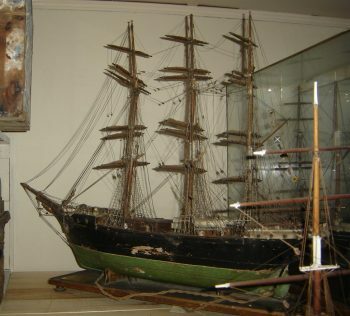 Delicate ship models may have broken spars, torn sails, damaged rigging, and paint loss. Properly caring for works of art that have aged or become damaged requires the attention of a specialist trained in art conservation and restoration. The conservator aims to stabilize the object and make repairs that will align with the artist’s original intent. The results of conservation can be striking. For example, see the before and after images showing the effects of treatment by the Sherman Art Conservation, Long Island based painting conservators, below. 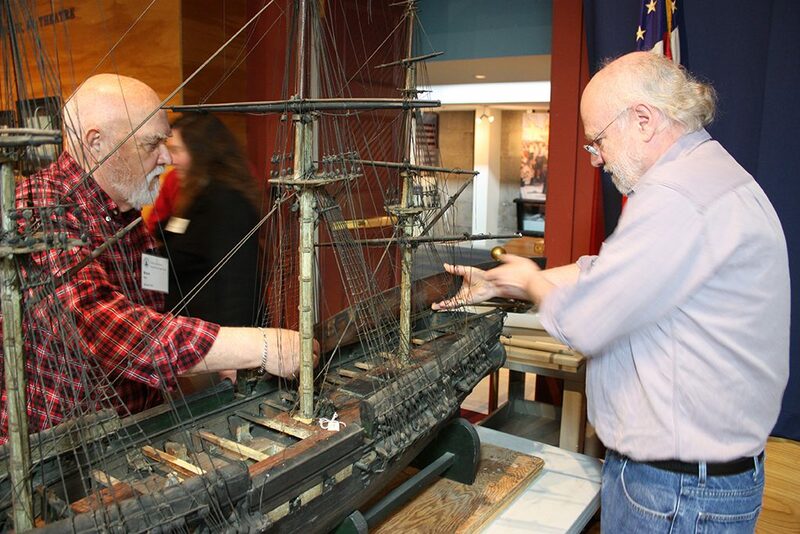 Restoring an Icon in Miniature illustrates the restoration of a model of the USS Constitution – a multi-year project that revealed more than 140 years of accumulated debris below the deck. To learn more about art conservation, visit the Smithsonian’s Museum Conservation Institute. Orient Captains Hazzard Rackett and Frank Norton sailed this schooner. As they grew in length, additional masts provided more sail area while keeping sails small enough to be handled with relative ease. This famous clipper ship was built by East Boston ship-builder Donald McKay in 1852. Two years later, she recorded the fastest speed ever for a sailing ship – 22 knots. The record held for nearly 100 years. Click here to sponsor this work. 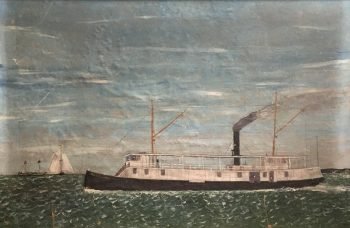 Hallock Farm had this propeller-driven steamship built in 1888, replacing an earlier sailing vessel, to bring produce to market. She required a specially dredged channel for her to navigate Hallock’s Bay at low tide. 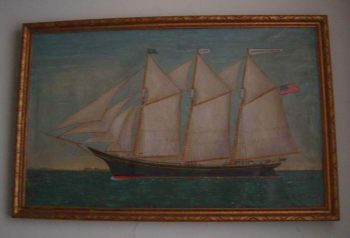 This barkentine was the largest vessel built in Greenport. Constructed in 1879 by Charles Smith and John B. Terry, its captain was Frank Norton of Orient. 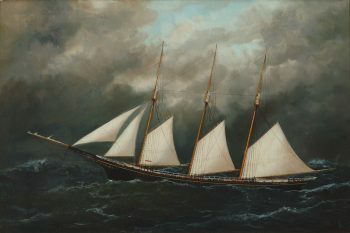 This centerboard schooner, built in 1882, was named for the wife of Captain William Potter and was jointly owned by members of the Potter and Latham families in Orient. Although the centerboard gave the vessel a shallow draft, the board’s casing took up valuable cargo space, leaked, and was difficult to maintain, causing this type of schooner to go out of favor. 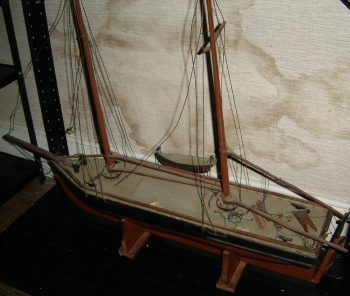 The gaff-rigged Leander, 39 feet long and 13 tons, sailed with a crew of three. 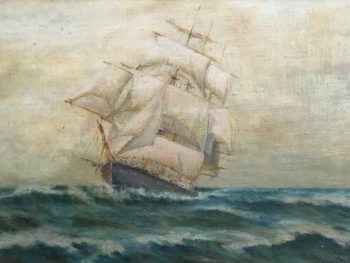 Orient residents Charles N. Franklin and Louis Vail served as captains of this schooner, which is shown here reefed in a gale. Franklin lived on Village Lane, a stone’s throw from Orient Wharf. 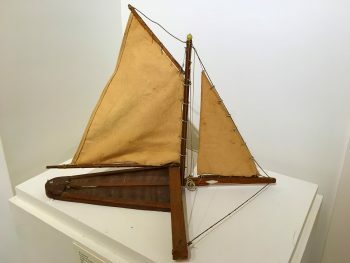 This model of the iceboat Slim was made by Howard F. King of Orient. Iceboating traditionally was a highlight of winter in Oysterponds. Captain William T. Potter of Orient owned this centerboard schooner, which was built in Maine in 1874. 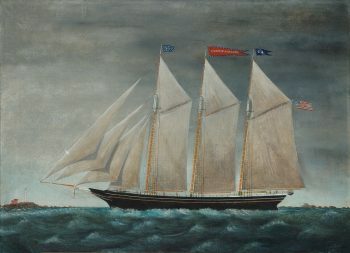 William Stubbs was a noted Boston-based painter who specialized in ship portraits. 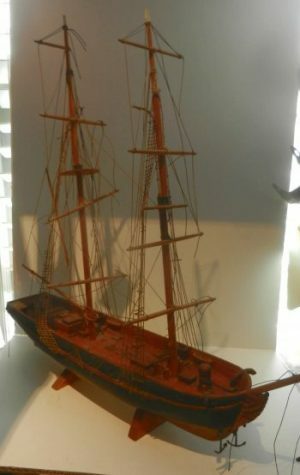 B. Clark Tuthill made this model on board a sloop when he was 18 years old. Tuthill later became a prosperous storekeeper and postmaster in East Marion. The Flying Cloud set the world record for the fastest sailing voyage from New York to San Francisco, 89 days, in 1854. The record stood until 1989. 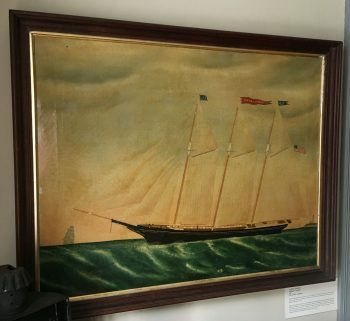 This second painting of the Curtis Ackerly in the OHS collections shows Montauk Point Light in the background. 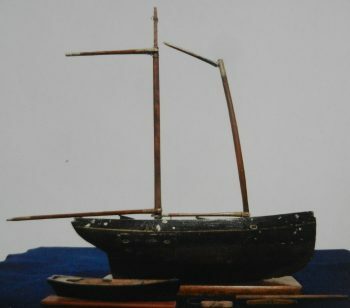 This small model was made by Henry King and likely sailed on local ponds. This unusually large two-masted schooner was built in 1855 for coasting trade on Long Island Sound. 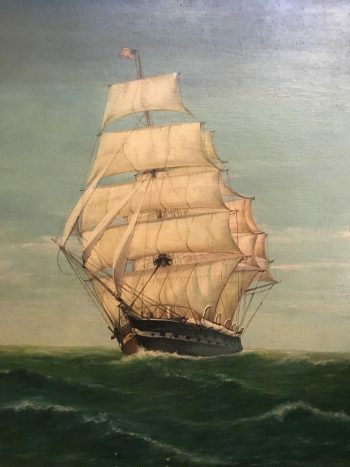 In 1862, her crew threw 200 barrels of molasses overboard to prevent her from foundering when heavy seas swept her jib-boom, fore-gaff, and fore-boom away. 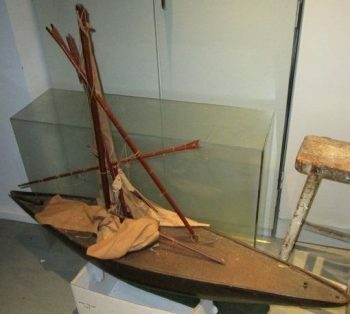 This model of a racing yacht was sailed on flooded fields, Majors Pond, and even Orient Harbor. 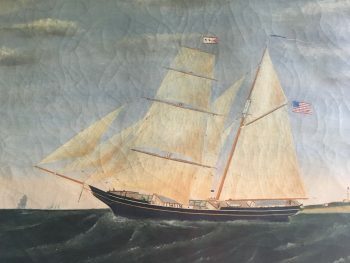 Painting of a schooner in full sail flying the New York Yacht Club burgee. 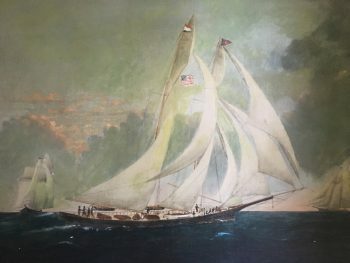 The original description named the schooner Wanderer, but if you look closely the name painted on the ship’s stern is Nandera. The whaling ship Charles W. Morgan, built in 1841, is America’s oldest commercial ship still afloat. Her whaling days ended in 1921 and since 1941 she has been berthed at Mystic Seaport Museum. This bark, painted by an Orient artist, bore the popular name North Star. This particular North Star was likely built in Boston in 1867 and called Newport its home. 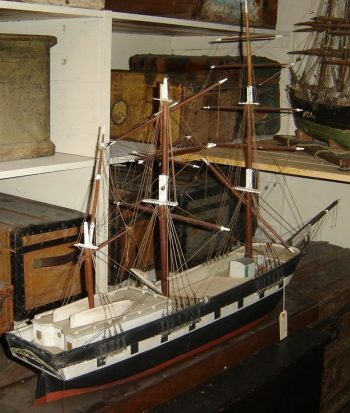 This ship model was made by Charles Davis, who married Carrie Hubbard of Orient. Their only child was William Steeple Davis, an artist whose work is well represented at OHS. Charlie made this for Carrie at the time of their engagement. 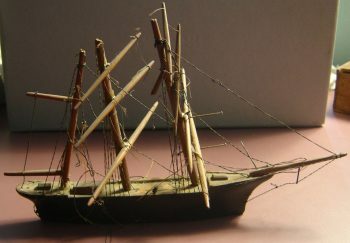 On April 12, 1873, Carrie wrote to her grandfather: This last winter …[he] improved his spare time evenings by making me a handsome full rigged ship in miniature. It is much admired. I long for you to see it, he named it “Carrie” after me. 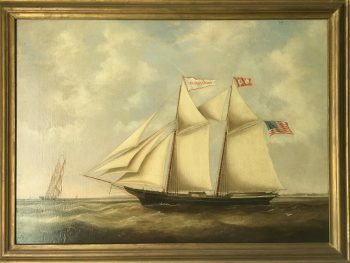 This schooner was named for the daughter of Greenport merchant and ship owner Nathan Kaplan, who made her colors. 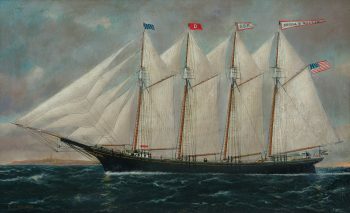 She was captained by John R. Potter and owned by members of the Potter family and William Young. 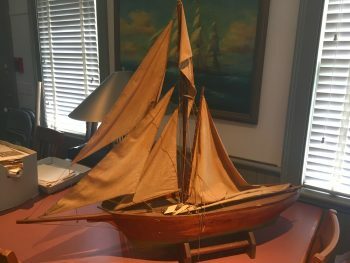 This small schooner belonged to William Steeple Davis (1884-1961), an Orient artist whose work forms an extensive and important part of the OHS collections. 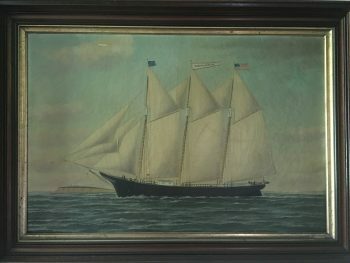 Marine painting of an unidentified square rigged three-masted ship signed by the artist. 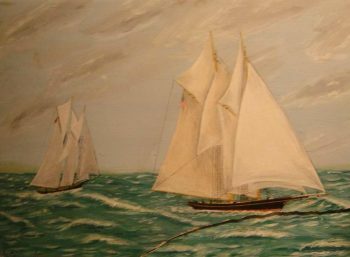 This painting by Greenport artist Whitney Hubbard shows sails on the bay – a common summer sight. 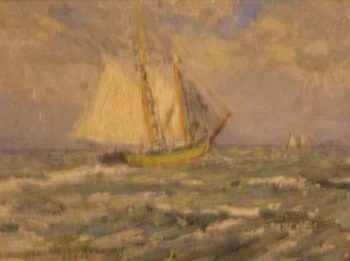 Orient painter George Cleveland was known for his marine scenes. His father, John Cleveland, had a blacksmith shop at the foot of Orient Wharf. 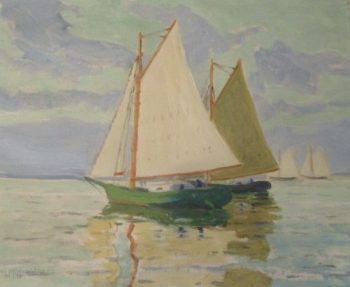 American Impressionist painter Whitney Hubbard lived in Greenport and was a popular art teacher. The front view of this square-rigged ship is a relatively uncommon vantage point. 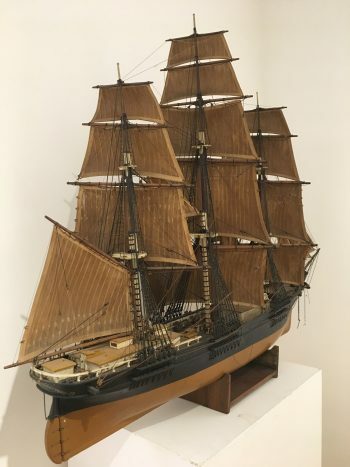 This model of the Elsie B. was made by a former master of the bark, who was incarcerated in Sing Sing for life. This charming toy square-rigger was given to Ruberta Tabor during her childhood.